“Decadent” and “sinful” are words commonly associated with chocolate, but they no longer apply. Approximately 4,000 years ago in Central America, the Mayan Indians considered cocoa beans “food of the gods” because of its medicinal benefits. Later, it got tagged as a “bad” fatty food. By the end of the 20th century, a twist of fate turned chocolate back into a health food. 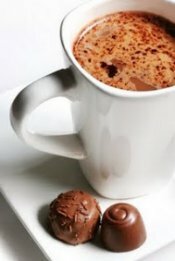 THE HEALING POWERS OF CHOCOLATE traces the origin of chocolate from bean to bar, from centuries ago to the present day. In creating this informative and fascinating book, renowned local health expert and author Cal Orey interviewed America’s top chocolate makers and chocolatiers, nutritionists, medical researchers, and chocolate lovers to find out how this ancient “food of the gods” can prevent and fight common ailments and diseases. The result is a lively comprehensive guide to the wide world of quality chocolate, from 70% dark truffles to Italian biscotti baked with extra virgin olive oil, in America and around the globe. With proven data for eating dark chocolate containing cocoa flavanols to reduce heart disease, diabetes, cancer, obesity, and dozens of pesky ailments, this book—with a European twist—takes you on a magical chocolate tour, complete with wit, charm, and entertaining personal anecdotes from ancient folklore to the 20th and 21st century. From ancient folk medicine to modern health wonder, discover the amazing powers of chocolate! Discover the healing powers of dark chocolate and cocoa—now widely recognized as an accepted “health food” and “Super Food”—versatile cure-all. Find out how chocolate’s powers can lower the risk of developing heart disease, cancer, diabetes, and weight woes. Learn how chocolate contains more antioxidants than green tea and red wine—without the alcohol. Put dozens of chocolate home cures to work for treating acne, anxiety, brain fog, cabin fever, cough, depression, fatigue, and other ailments. You’ll also find chocolate beauty and anti-aging treatment—from masks, manicures to bubble baths and body wraps—made from antioxidant-rich chocolate teamed with natural plant extracts. Incorporating cutting-edge scientific research, plus Mediterranean-style heart-healthy chocolate recipes, from Sicilian Mole to Dark Chocolate Mousse, THE HEALING POWERS OF CHOCOLATE is a well-rounded one-of-a-kind resource that will show you why savoring this no longer forbidden “food of the gods” is the 21st century trend. Cal Orey is an accomplished author and journalist specializing in topics such as health, nutrition, science, and pets. Her books include The Healing Powers of Vinegar, The Healing Powers of Olive Oil, 202 Pet Peeves, and Doctors’ Orders. For more information, please visit her website at www.calorey.com.